By God’s grace, He opened the door for me to take my second course in graduate school over the next two weeks in the Dominican Republic. I was short three days of vacation time at work, but Marge RN, who is retiring on December 31, kindly gave me three days from her vacation account. She said she wanted to encourage me to become a Nurse Practitioner. I arose at 5:30 a.m. and flew through Puerto Rico to get here. I heard Spanish throughout the plane, but they spoke so fast that I could only pick up bits and pieces. Dr. Elaine is the professor from State University and has been here quite a few times. She is single and has traveled all over the world, having worked for four years on the Ship Hope. Her Spanish is quite good. Debbie is a senior undergrad nursing student and speaks good Spanish, having been an exchange student in Spain when she was fourteen years old. Julie is also a senior and seems a little nervous and speaks no Spanish. Paula will be my roommate, is a senior in nursing, and comes from a neighboring state university. Dr. D, who is certified in tropical and travel medicine, gave us several valuable lectures before our departure. I completed the required readings on the culture of the Dominican Republic and their specific beliefs. We began taking our malaria prevention medicine two weeks ago. Dr. Elaine told us about a helpful book written for the layperson called “Where There is No Doctor”. It has also been translated into a number of languages. It tells how to treat common ailments with locally available plants and foods, how to build a sanitary latrine, how to administer first aid, etc. I called missionaries who live here, and Pastor N. will give me a ride to church on Sunday, January 8. His daughter is an MD and began a clinic, church, and school about 20 miles from here which she administers, so he will also take the group there when we return to Santo Domingo. It is wonderful to leave all the details of the next two weeks with the Lord. I don’t know why the Lord brought me here, but I’m excited to be here and let Him work through me. Paula arrived late last night, so our little group of four students is now complete. She is a kind outgoing girl and a considerate roommate. Her first degree is in biology and her second will be in nursing. Her Spanish is much better than mine, so that is helpful. At noon, the clinic pharmacist, Angel, picked us up for our four-hour ride to the town of San Juan near Haiti where we will be living and working for the next nine days. 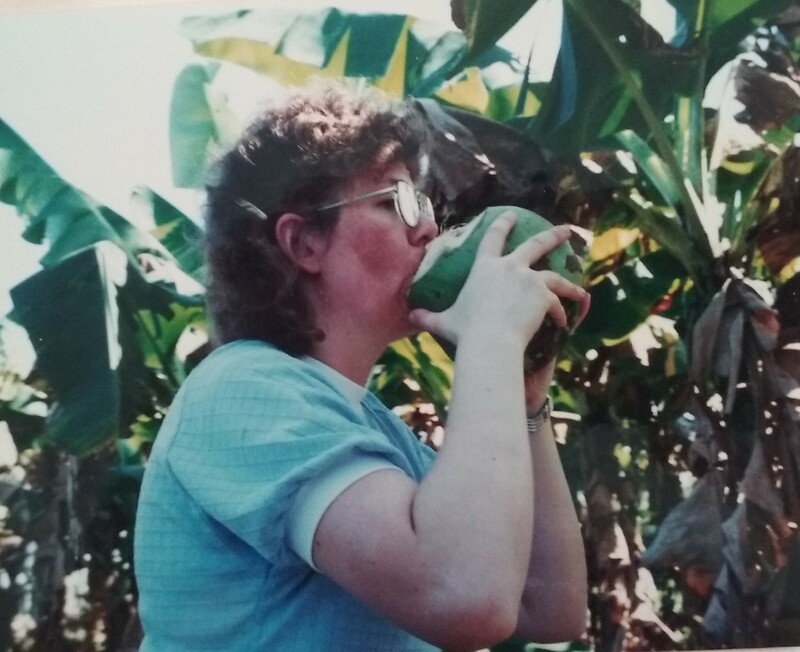 As we rode through the lush green countryside, we passed blooming pampas grass, banana trees, bean fields, oxen, donkeys, goats, pigs, and trucks loaded with lemons. Dr. Elaine informed us that they are racially conscious in the DR. The lighter one’s skin, the higher the class of the person. Every young person wants to marry a person with lighter skin than theirs so they can move up the social scale. We arrived at the Mennonite clinic and were warmly greeted by Cora, a Canadian Nurse Practitioner, and Tammy, a nursing student from my hometown who will translate for us. The gorgeous hot pink bougainvillea and red poinsettia trees are in full bloom. The inviting thatched roof gazebo is complete with rocking chairs. Cora and Tammy served us a delicious dinner of three different kinds of pizza with fresh squeezed lemonade, bananas, and cookie bars. Cora then began our orientation. She said to be careful of the young men, many of whom want to marry an American woman solely so he can become an American citizen, move to New York, and then disappear. She told us several sad stories of this happening to American single women. Cora showed us photos of some of the 500 infants in her survival program. The changes were amazing. She has only had about ten infants die in the past eighteen months since she started the program with fifty infants. Many mothers don’t return after the first visit, so she has difficulty keeping accurate statistics. Cora helped me put my netting on my bed to keep out the nasty mosquitos. I am already itching and only brought a small tube of cortisone cream. Tomorrow we stay overnight in a village for our cultural immersion. 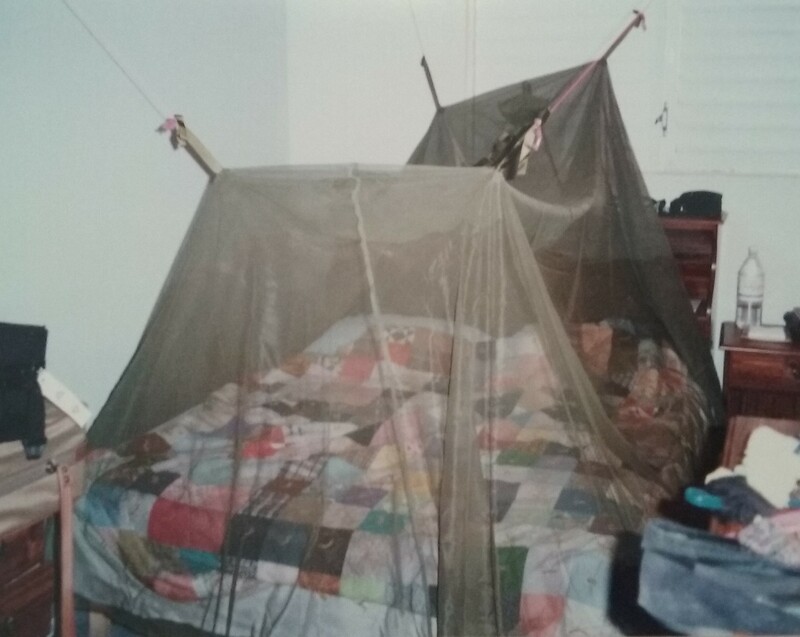 Mosquito netting in place to protect me from malaria. Our morning began with delicious quiche, papaya, fresh pineapple, squeezed orange juice, homemade granola, and coffee for breakfast. Then Cora gave us a tour of the clinic run by the Mennonite church. They have several primary care exam rooms, two operating and recovery rooms, pharmacy, and a lab. It looks quite modern and advanced compared to other developing countries I have seen. Then we toured the crowded noisy busy market with fresh produce, rice, beans, and newly killed plucked chickens for sale. I bought a unique metal lime squeezer. Angel drove us to Pan Dia Village (Our Daily Bread village) for our cultural immersion with the Health Promoter named Clara. Paula and I will live tonight in this village, and Julie and Debbie will stay in another village. 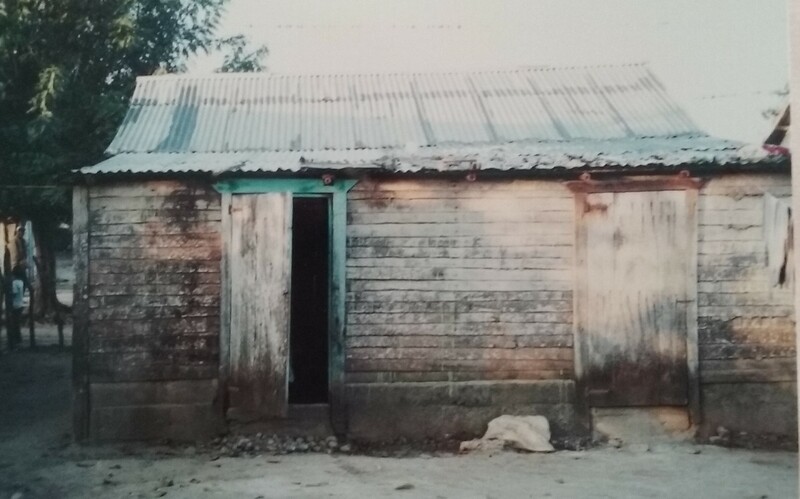 Since no one in either village speaks English, we will have at least one student who speaks fairly good Spanish. Clara showed us to the Peace Corps worker’s home where we will stay tonight while she is away on holiday. 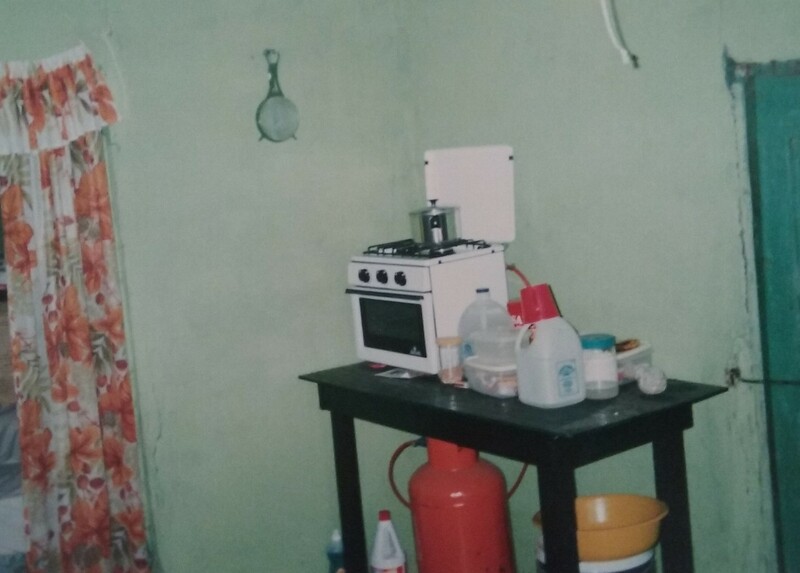 There is one double bed, a kitchen table, a small two burner gas stove, and oven. The outhouse was covered in excrement which Clara cleaned while we took a nap (siesta). Our village home for cultural immersion. A family of four was on the other side of the thin wall. The Peace Corp worker’s simple kitchen where we spent the night. Four teen girls and guys took us on a hike through the village and the countryside. We didn’t know where we were going or how long we would be gone, so we made the mistake of leaving our water bottles behind on this hot day. 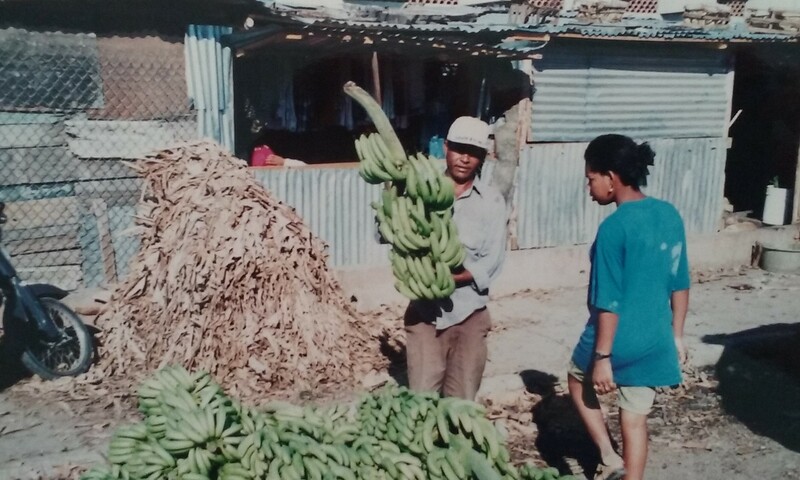 The country is beautiful with fields of corn, tobacco, beans, and banana trees. 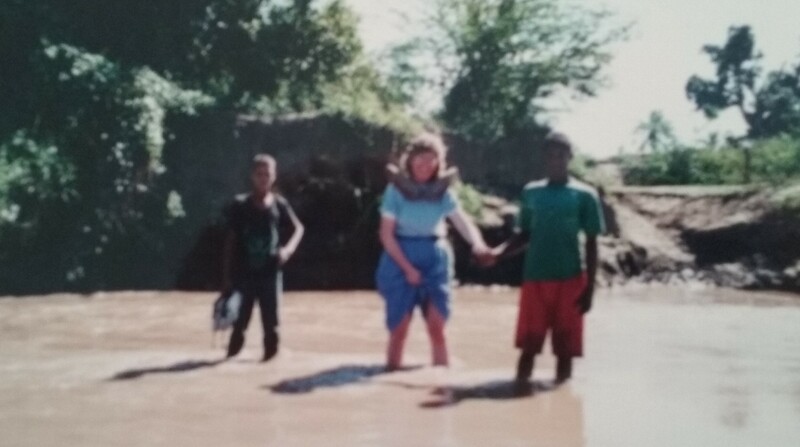 We crossed a river with much trepidation. Dr. Elaine told us not to wade in the river in bare feet because we might pick up Schistosomiasis worms (Snail fever) through our feet. https://en.wikipedia.org/wiki/Schistosomiasis. One of the young guys, who weighed about 120 pounds, carried the other girls across the stream on his back, but I couldn’t let him carry me. I took off my shoes, held his hand, and waded across while asking the Lord to protect me from the worms. The water was refreshing because it was about 90 degrees out. The boys helped me wade across the stream. I prayed I wouldn’t get worms through my feet! Then one of the boys shinnied up a coconut palm tree and threw down a bunch of ripe coconuts. The other guy pulled out a machete, sliced off the top of the coconut, and handed us each one to drink. The coconut milk tasted wonderful and quenched my thirst. Dr. Elaine taught us that coconut milk is an isotonic solution (same pH as human blood) and could be infused intravenously for fluids in an emergency. Refreshing coconut milk on a hot day. Then a man took us back to Pan Dia in his pick up truck. Clara served us a beautiful lunch of chicken, rice, fried vegetables, and banana. I added orange soda pop to drink that I bought at the local store. It’s exhausting to try and communicate and listen to the Spanish. I’m trying hard to remember all the new phrases and words I’m learning. There is a baby screaming on the other side of our thin wall in our home, dogs barking outside, and loud motor scooters speeding by constantly. So much for peace and quiet in the country. And so began our two-week transcultural nursing course in the Dominican Republic. I was exhausted the next morning after being up most of the night from the screaming baby on the other side of the thin wall, blaring latino music, and dogs barking. But it was a great experience to learn how many people in the world learn to live with very little.